Sarcasm. Hyperbole. Both are useful tools in a writer’s arsenal. When combined, they can make for rather incisive criticism of a person or idea. 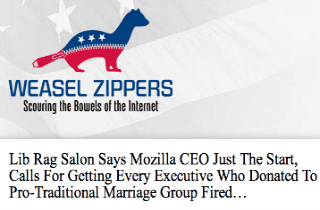 Take, for instance, Will Saletan‘s piercing satire of the thought process behind purging Mozilla CEO Brendan Eich for his anti-gay marriage views. Like Andrew Sullivan and this young scribe, Saletan holds pro-LGBT views but happens to find the ousting of Eich distasteful. And so he took to his Slate column to mock the mentality of expelling businessmen from their jobs for having supported a loathsome 2008 California proposition that has almost nothing to do with their given job. And at other points this morning, Saletan has offered effusive praise for Sullivan’s views on the matter and conservative author Reihan Salam‘s analysis of the Eich story. 1) The piece ran at Slate, not Salon; and 2) Saletan was, uh… being sarcastic. There is a conservative meme that asserts Salon and Slate are one in the same, but WeaselZippers isn’t exactly a humorous site. Either way, the commenters are having a field day. And it’s quite hilarious to see how many of them don’t actually click… the… link… to see that their humble aggregator got the publication and the entire concept of the piece wrong. Instead, they just go on about the “gaystapo” and invoke the Nazis. This comment is particular rich, considering Saletan’s piece is parody. After re-reaing the article it’s satire, in my defense Slate, Salon, HuffPo etc. post nuttier pieces than this on a regular basis as we’ve documented here countless times before.